Such was the positive response to Issue 1 that Les decided to continue running the magazine as an independent entity, whilst still keeping close ties with BUG. Page 6 was initially published under the organisational title of ABACUS - 'Around Britain Atari Computer Users Society' although this was later dropped in favour of 'Page 6 Publishing'. In late 1983 Atari Corporation's own 'Atari Input/Output' magazine featured an article about Page 6, including a photo of Les Ellingham proudly holding issue 4 [it's reproduced here]. The magazine was published on a bi-monthly basis and continued to expand and improve with each issue. As more Atari owners discovered and subscribed to the magazine, and supported by a modest array of advertisers, Les was able to invest in enhancements to the paper, printing, and design quality. Page 6 Publishing diversified into other forms of Atari support - the "Accessory Shop" was established to supply dust covers, books, blank disks, software and other extras. The Page 6 public domain library provided a growing collection of specially compiled disks, with the emphasis on quality rather than quantity. Later, Page 6 obtained various items of commercial software to re-sell at bargain prices, and even re-published a few titles on its own label - including Transdisk IV, Tari Talk and Mini Office II. 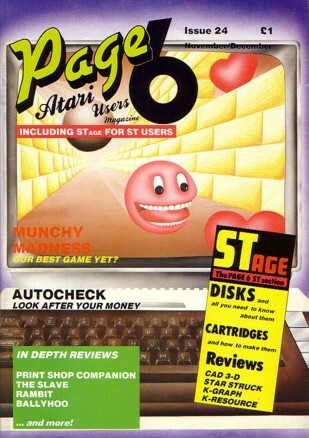 With the launch of Atari's 16-bit ST machines in 1985, regular ST coverage was introduced into the magazine. In Issue 24, the ST pages were given their own identifiable section under the title "STAGE". An ST Library was formed, which eventually offered many hundreds of unique public domain software compilations. Page 6 hit the big-time in 1987 when Issue 29 was launched into the mainstream newsagent distribution channels. By now the magazine had expanded to 82 pages each issue, with increased use of internal colour and a professional layout. Contributors who had previously submitted work for free were now paid for their articles and programs. Nevertheless, Page 6 succeeded in retaining its 'enthusiast' community style. 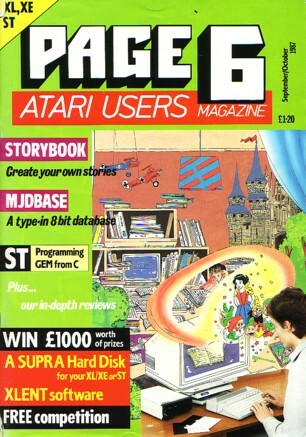 Back in mid-1985 Les had been approached by Database Publications, who already produced magazines for several popular computer formats, and asked whether he would like to be the Editor of a new magazine for the 8-bit Atari. 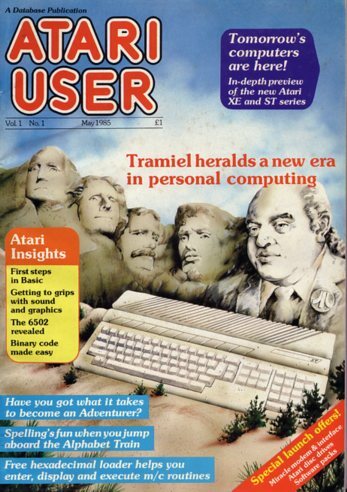 Les politely declined the offer in favour of continuing Page 6 - and consequently gained a competitor in the form of Database Publications' colourful Atari User magazine. 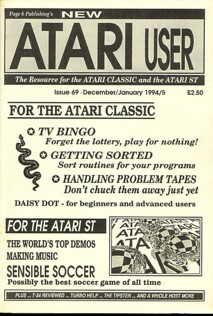 In late 1988 Database Publications had a shake-out of their less popular titles and decided to close down Atari User - the last issue was Vol 4, No 7. 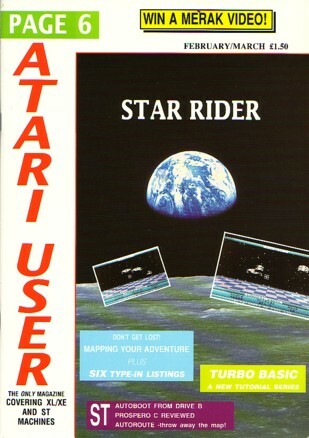 Les stepped in and bought the rights to Atari User and its subscriber list to merge with Page 6 - although little of Atari User's style and content were actually retained (no bad thing, some would say). 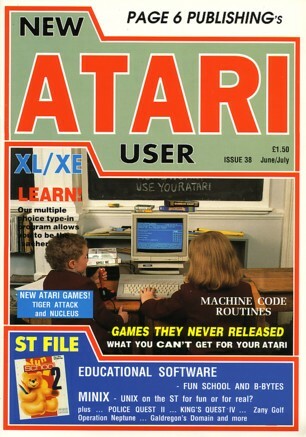 From Issue 36 Page 6 became 'Page 6 Atari User' but this caused confusion in newsagents who thought both magazines had ceased publication, so the title was changed again in Issue 38 to 'New Atari User'. Ultimately, proprietary home computer formats lost out in favour of the IBM compatible PC. As Atari popularity inevitably tailed off in the 1990s, it was necessary to reduce the production costs of New Atari User. This was achieved by reverting to the original subscription only method of distribution, and by dropping some of the expensive embellishments such as multicoloured cover photos. 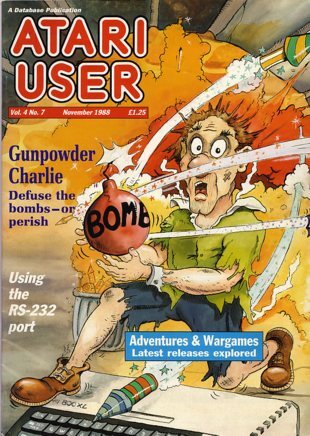 With Issue 60 in February 1993, Page 6 Publishing was able to celebrate its tenth anniversary of magazine publishing - no minor achievement in the volatile world of home computer magazines. In December 1995, Issue 69, a decision was taken to cut production costs further by 'downsizing' the magazine into an A5 booklet format. The number of subscribers was eroding, and the magazine struggled to remain viable. 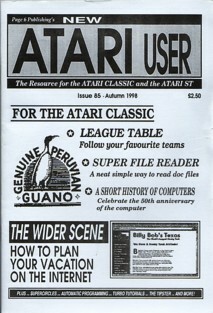 New Atari User continued publication in the A5 format, albeit with increasingly irregular gaps between issue dates, until the final Issue 85 in Autumn 1998. There was no official 'goodbye' since Les had good intention to publish a few more issues. Sadly, due to financial constraints, they would never transpire. 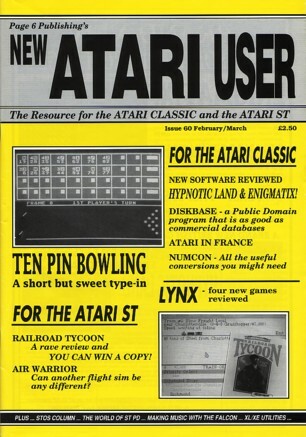 Page 6 is remembered fondly by many Atari owners as a unique and invaluable resource, supporting true enthusiasts in the heyday of Atari home computing. 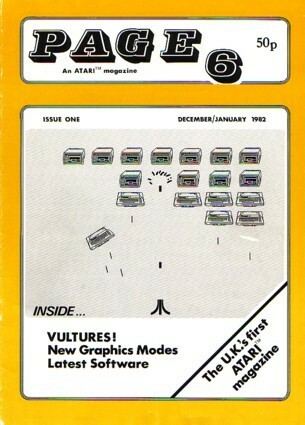 The term 'Page 6' has a special significance in 8-bit Atari computing. The Atari's random access memory is structured in groups of 256 bytes, each known as a 'page'. Page 6 represents the memory locations 1536 to 1791, which are not used by the operating system or inbuilt Atari BASIC. This means Page 6 can be used for machine language subroutines, redefined character sets or indeed any data users wish to store in the space. In other words, Page 6 is a valuable resource for Atari computer users. And a fitting title for the magazine. This site has been designed and constructed by Paul Rixon, who was a regular Page 6 contributor from issue 29 onwards. Contact. Les and Sandy Ellingham without whom Page 6 would never have happened, and for granting permission to reproduce material on this web site. Paul Lay for his excellent 'AtariLister' applet; and many others who have kindly provided help and encouragement towards the development of this site.